Well..... we have finally decided on our new branding. I am so excited. I have been busily working away on our blog for this business. Kind of addictive! 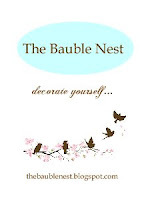 Check it out www.thebaublenest.blogspot.com. We also have just received fabulous new stock which I will photograph and post today.